I watched as her pale, thin fingers thumbed through the sandwich. She pulled out the tomato and sat it down on the wrapper beside her. She looked to be 14 or 15. Her hair was long and stringy and her clothes were not in the latest style – hand-me-downs or discount store fashion I presumed. She was turned away from the other kids who sat as far down the bench as they could get from her. She was also turned into herself perhaps in an attempt to make herself invisible. She attracted no attention and sat quietly taking tiny bites form her sandwich. She pushed her thick glasses back onto her nose and neatly wrapped the rest of her sandwich and placed it in her bag. I watched as her thin, frail legs walked over to the table, she took a few oranges and a banana, and went back to her isolation to tuck them into her bag. Her lips were silent for the entire time that I watched and no one else made an attempt to talk to her either. I couldn’t take my eyes off of her. In my mind, I developed a whole back story for this girl. I imagined what her siblings and parents were like. I figured that the khakis she had on were required by the school and that she had little money to go out and buy the latest style, so she was reduced to wearing hand-me-downs from her older sister or something that she could have gotten at Wal-Mart. The same went for her shoes. Watching her eating habits, I figured that there was probably not a lot to choose from at home and that her sneaking the extra fruit into her bag was a way for her to provide sustenance for herself. My heart hurt just looking at her. I knew just how she was feeling and the thoughts that were going through her mind. I knew because I have been “that” kid before. And it hurts. I grew up in a small Southern town. Most of my childhood, I was overweight. I didn’t find the typical “guy things” like hunting, fishing and sports very interesting. I was a pretty good student and was certainly more artsy than athletic. My clothes didn’t always have the right logos and colors. And my name was Stacey. The odds were stacked against me. I was called all the names. I was always the last picked for the dodge ball team – and the first one out. I wasn’t invited to the coolest birthday parties. School was a nightmare for me. I would fake sick to be able to stay home. It was torture – absolute hell. If you’ve ever been that kid, then you know exactly what I’m talking about. The thing is, most folks are never that kid. They go on doing what the others do – laughing and mocking – in a effort to stay with the “in” crowd. I was fortune enough to find the right friends in high school and found my niche. The teasing and taunting never stopped altogether, but happened less. And I learned to deal with it better. If you are that kid, let me tell you something… It WILL get better. It might seem like it’s endless, but it’s not. You must remember that people can only make you feel bad about yourself if you let them. Ignoring the haters will only make it worse for a period of time, but eventually they will lose interest and move on. I promise you this. Many of those people are just not built to deal with different, so they do what they do. But trust me, being different is okay. It will get better. I have been there. I have been called the names. I have been teased and shoved and picked on. Even as an adult, I find some social situations unnerving – I’ll never be able to shake those kinds of feelings. But you know what… some of those people who did those terrible things to me have asked me to sign their copy of MY book. And I will. And I will smile and write something kind with it, knowing the whole while that it’s my signature they want. I will be the bigger person. And one day you’ll get the chance to do it too. I promise. Keep your head up, do the right thing. One day, you might even be glad you were “that” kid. I am. Y’all this Grits and Sausage Casserole is an absolute favorite. It’s easy and is a hearty breakfast that is perfect any time of the year, but especially during those cold winter months. I just know that your family will love it just as much as mine does. Preheat the oven to 350°F and lightly spray a 2-quart baking dish with non-stick cooking spray. Cook the pork sausage in a medium skillet over medium-high heat until no longer pink. Drain the grease away and set aside. Heat the water in a medium saucepan to boiling. Stir in the salt and whisk in the grits. Stir briskly to prevent clumping. Reduce the heat to low and simmer for 10 to 12 minutes, or until tender, stirring occasionally. 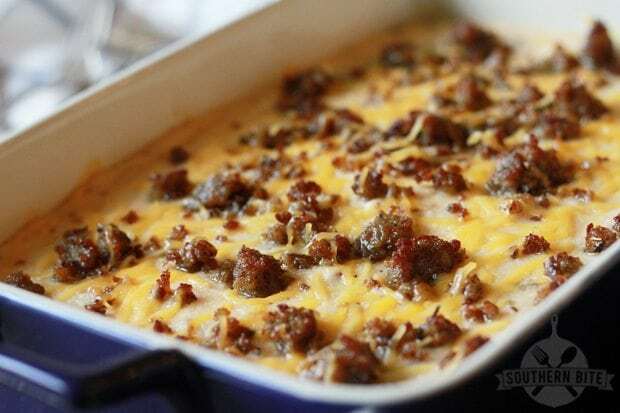 Add the drained sausage (reserving about 1/4 cup for the topping), cheddar, and cream cheese and pepper into the grits. Stir well and pour into the greased baking dish. Sprinkle the remaining sausage on top and bake for 25 to 30 minutes. As someone that went to that same high school and suffered those same abuses your story touched me more than you could ever know. I was a few grades behind you but I thought you were wonderful in high school and I had no idea that people mistreated you. It just goes to show that you never truly know what other people go through in life. I think your recipes are amazing and I wish you all the success and accolades that you justly deserve. God Bless you. Thanks, Annabella. You’re right, you never truly know. Being a kid can be tough stuff. Thanks for your kind words. Thank you for sharing from your heart today. I’m sure you have touched so many, more than you know. The casserole looks delicious! I have really been into grits lately. Can’t wait to try this! Thanks, Steph! I’m crazy about some grits! I am sorry you, or anyone, has to suffer through experiences that hurt, but take heart because it has made you stronger, more independent, wiser, and more empathetic to others. That must have been the purpose of God’s plan for you. Now you are a husband and father and many blessings have come to you with time and maturity. Try to instill your well deserved values into your children and the blessings you now enjoy will multiply and spread. I sure hope I can do just that! Beautiful words. I was sort of “that kid” as well. Though luckily not as many people outright picked on me. They just thought I was a little strange. I only remember a few incidences where I was outright teased. It does get better and it feels awesome. 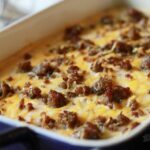 Tasty looking casserole! I’m the only one in my family who will eat this but I’ll eat the heck out of it and freeze the rest for later. Thank you! Your post today was just awesome. It took a lot for you to share your experiences with us. Thank you so much for having the courage to do it! Stacey, I was also “that kid” who was different looking as a child. I was always tall for my age and ended up at 5’10”. I was very self-conscious about being the tallest girl in the class and would try to scrunch down in my seat to appear shorter. The biggest slam I heard was when I was about 13 and some boys called me Spider Legs while we were waiting for the school bus. I wanted to die on the spot! However, eventually my legs filled out, I married a man who likes it that I’m tall and I have received many compliments on my pretty, long legs. Anyone who is slightly different from the crowd is “that kid” as a child. Now I’m a grandmother and like it that I can reach things on the top shelf of the cabinet. Hang in there, kids. It evens out in the end. Stacy, your comments made me cry!!! You are so awesome. I can’t imagine – but guess what? You won!!! You are an incredible person and I value just getting to know you through your website. 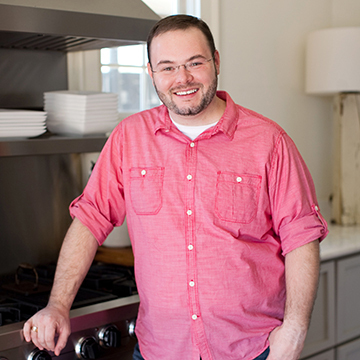 I love your recipes and I hope you become a MILLIONAIRE!!!! You are so deserving and such a great human being!!!! 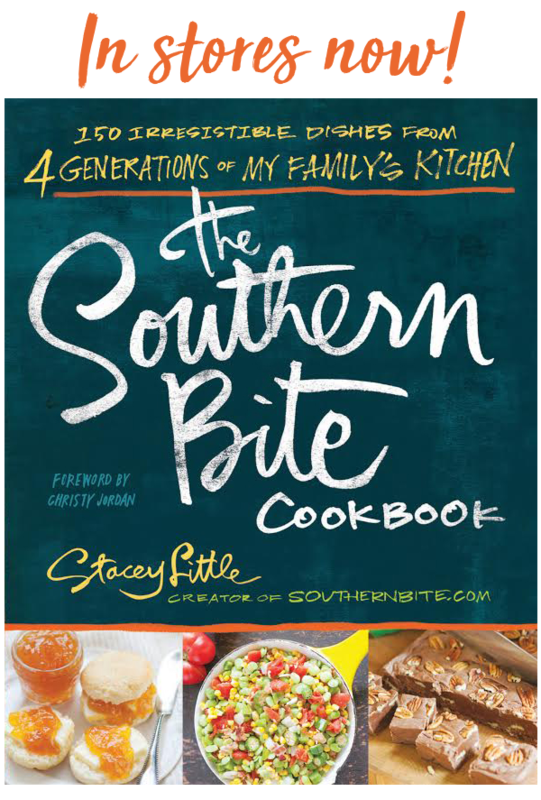 I cannot wait to get my cookbook. Take care and God Bless You and Yours!!!! Thanks, Judy! You are so sweet. For all “those kids” out there……thank you for your big ol’ heart. Kids can be so cruel and being a bully is so hateful! They must have a miserable life if that’s what it takes to make them a “bigshot”. How sad! The casserole sounds so good and easy. Will be making it this weekend for brunch. Thanks for this blog! It is sad, but true! But it does get better! Thanks, Mary! Thank you for sharing. It amazes me how children treat each other. It amazes me how adults can treat each other. The world would be a much better place if we look out for those who could use a kind word, a hug, a smile or even an extra apple. I pray that I have taught my three children to look out for others and love them no matter their situation. Again, thanks for sharing! People can be so hateful. But I think going through things like this makes us stronger, more compassionate people. In that way, I’m glad it happened. I was always picked last in gym class because I was the smallest and had no interest in anything to do with sports. Other than that, my school life wasn’t too terribly bad. It got better as I got older, and as a 47 year old it is so wonderful not to really care what anyone thinks! I know some of those same people that treated you badly are probably not being what they thought they would be in their adult lives and wish they had your joy. Keep up the good work and be proud of what you do! Thanks, Tracey. That means a lot! Thank you for saying what my heart has had on it for years . Like you I was a “THAT KID”, and yes with time and effort it does get better. Hi Stacey- Thank you for sharing your story today. It brought tears to my eyes, and I am happy for your success. I cannot wait to receive your cookbook. Thanks, Joanne. I hope you enjoy the book! Reading that about you filled my heart with tender affection. I would love it if kids all over could read this perspective. I wish it could make a difference in their selfish little lives, but , alas; they are foolish youngsters who haven’t a clue what’s ahead of them as they mature, get married and have children of their own who may turn into “that kid”. May God richly bless you for your deep sharing. Thank you. Thanks, Sherry! My hope is that in sharing, someone out there might realize that it does get better! Thank you for sharing a painful time in your life. Am sure it will help others to be more aware of how we can all do better in this life. Transcend and you are transformed! I am not a lover of grits, so is there something else I can use in place of them? Hi Debra! For this recipe, I’m just not sure there is a replacement for the grits. Nothing else is going to give you quite the texture and flavor of grits. Thanks for joining us from The Southern Belle Charm Facebook page! This casserole is very good. I,m printing out some extra copies for some friends. Wonderful, Marie! So glad that you enjoy it and are sharing! Found you from the Country Cook! I thought we were going to be friends after reading a couple of your recipes. After reading this, I KNOW we are going to be friends. I was that kid – poor, thrift store clothes, thick glasses, stringy hair, crazy accent. All the hell was character building exercises and I am happy with the way my character has turned out! Welcome! And GO YOU!!!! Things do have a way of working out, don’t they??? Just a quick question on your grits recipes. Do you use the quick cooking grits for all or do you specify which ones you need? I really enjoyed your segment on the Today show. After seeing you I checked out our website, and love your recipes. This particular post strikes home for me… I was “That girl”, for years and years. It damaged my self-esteem and to this day I still struggle with it at times. Thanks for acknowledging that this does exist, and showing how it is possible to move one… Your awesome! Can you make this the night before and heat up the next morning to serve? Surfing one day for greens and grits recipes, I stumbled onto your page. Being the southern boy that I am I love the foods you cook. Also being the southern boy that I am, I was touched by your heartfelt story. Poor, holes in shoes, hand me down clothes, and red headed, I remember all too well the names and sayings that kids come up with in early years. Luckily , as I grew older, I too found my saving grace….in my athletic ability. In later years as taunts faded into cheers, I never forgot the cruel sayings and promised myself to never be like those people. Head held high, I overcame all the self esteem issues and lived a happy productive life. You do survive! Kudos to you. God Bless. Hi John! Thanks so much for your kind words and for sharing your story. It’s certainly something that folks out there need to know. It happens, but its still important to hold your head high and move on. Better days will always be ahead! Thanks again! Love your story! I have a question about the casserole, can I make ahead and refrigerator, then cook it the next mornin? I was not picked on but my son who is autistic was nearly destroyed in middle school. At 40 years of age he still deals with the pain of that terrible experience. Children can be so cruel. We are dealing with it as best we can. I am curious as to what you would serve with this. What a great brunch entree. I am giving a shower for my niece in Nov. I was thinking maybe blueberry muffins, but what else? I think blueberry muffins would be a perfect complement. If it’s brunch maybe even a nice salad on the side. Stacey, I read your story about the girl below the Grits Casserole picture. Thank you for the recipe . . . . it looks great and I’ll surely try it, but God Bless you for the story about “that kid” I lived that child’s life for 18 years until I went in the service and after about a year realized that I was every bit as good as all those other people. Fifty-five years later, I am an old man but the scars are still raw and tender. I am not too proud to admit that I shed a tear or two when I read it. Thank you for sharing, and if wishes could ever be granted, I’d wish that every “that kid” in the world could read it and learn that lesson. Hang in there kids. Your day WILL come, it has to and you have earned it. Stacey, though I have to admit I haven’t read through all the comments about being That Kid, I can tell you we/I have been there one way or another. What you say is true that it all gets better and changes. But thinking about all the years children have to endure the abuse before that happens is awful. Kids are so cruel and probably because as children we are so vulnerable. We want so badly to fit in and just be liked, to be happy and cared about. We are so insecure at those ages. It often hurts much more. I remember. When my girls were young, I made sure they were wearing acceptable clothes and honored their feelings of fitting in. I tried to make it as easy as possible to alleviate the peer pressure and abuse. I don’t believe anyone benefits from it, even after it’s done and gone and over with. Even after it gets better. That hurt still remains. You never forget it. I feel for you that you had to endure that. I have seen many who did. On a lighter note, love your recipes!! I love to cook and bake. Carry on! The world needs good recipes to eat and feed their family and friends!!!! Hi! What are “grits”? I’m from Minnesota and don’t know what they are or how to obtain them. 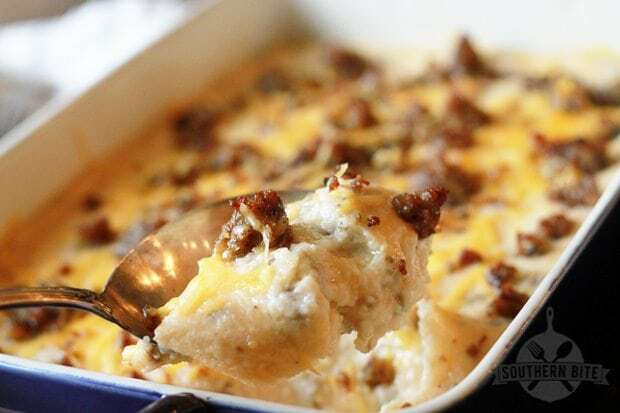 Your “casserole” (I’d call it a hotdish) looks delicious! Thanks! Grits are course ground corn, kind of like polenta. Hi! Can you freeze this? My husband and I just finished the leftovers tonight. I am so happy I made the whole recipe so we could have another yummy night. This was so easy to make and so delicious! I will be making this again! Thank you! I will have to check out your other recipes….. So glad y’all enjoyed it! Hope you find lots more you enjoy, too! I’ve been there and survived! Thank you and take care. Recently found this awesome recipe. We cooked it like in the recipe for supper one night. Then we thought it make a great quick breakfast since everything is already cooked. We mix everything together & then put in greased muffin tins & freeze. Once frozen we pop them out wrap each w/plastic wrap & put in a big bag in the freezer. We end up with around 15 “Grits Pucks”. Usually we use two of what we call “Grits Pucks”. We add a spoonful of water when we heat them in the microwave for about 2 minutes. Thank you for such a delicous recipe . Hi Lindsey! I have done it that way. It does firm up quite a bit more, but is still delicious. That said, I do prefer it made fresh, though. I made one similar to this last night. It has eggs instead of cream cheese and always a favorite. At 53, I’m still one of those kids but I’m comfortable with who I am. It takes a little while to get there, but glad to hear you’re there too! 🙂 Sounds great! God Bless You Stacey! That is a pet peeve of mine… to see people mistreated… because I have been there too! But it has taught me to love the ones that are more! Thank you for sharing! I hope you have a MUCH better life today! Thanks, Ginger! Yes, things have certainly turned the corner!